You have received files with patterns and tables with the course. First of all, print them with printer set at actual size parameter and arrange them into stacks. In the photo the stack with the patterns for the face of the corset is on the left and the patterns of the lining is on the right. Notes on differences between face patterns and lining patterns. The lining pattern of the corset has separate cut-off cups and there are no seam allowances for the upper edge of all pieces. In other words the lining is an analog of a transparent corset with cut-off cups, but it has seam allowances at the bottom of the pieces. 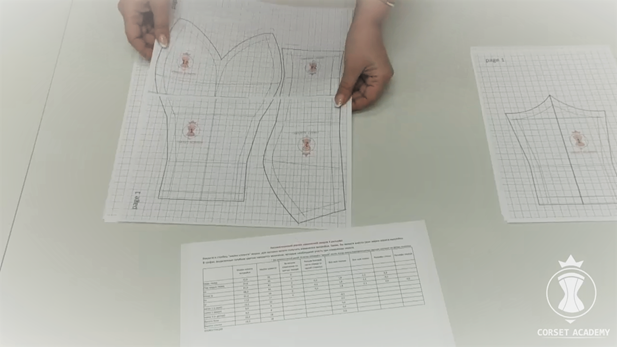 A pattern for the corset front is an ordinary opaque corset pattern with all relevant seam allowances on the upper edge and the bottom of the pieces. I developed a hybrid of transparent-opaque corset for this dress design. To combine the pattern pieces you just need to glue together the first two sheets of the corset lining pattern. Remember not to pay attention to non-colored technical areas along the edges of the sheets when combining sheets. Let us look at the tables of automatic calculation. It's very easy to work with them: you enter your client's measurements into the respective column and print out the table with the ready calculation. I strongly recommend making a simple mock-up of any cotton or non-woven fabric to test a new pattern. For this purpose it is convenient to use non-woven fabric, where the printed basic pattern can be easily traced. Put a mock-up on a dress-form and take all key measurements. It will help you to define the size of the standard pattern. 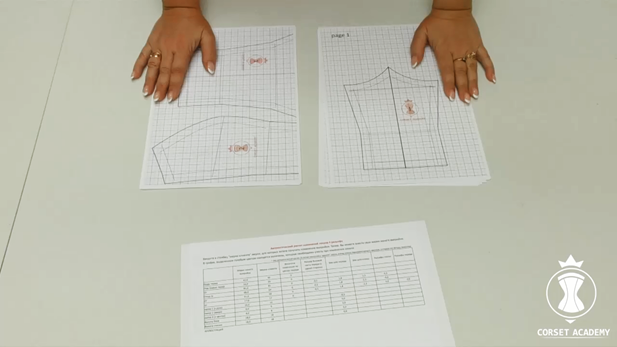 As an option, you can measure the key lines without seam allowances in the print-offs of corset pieces for precise calculation of standard pattern measurements. Next compare the determined values with the measurements of the standard pattern, indicated in the table. There are 2 tables with examples in the course. The first table indicates the measurements of my client. However, the pattern adjustment for my model is minimal, and it does not illustrate the peculiarities for adjustments of a standard pattern. Thus, I used the second table, where I specified the measurements of an imaginary client to demonstrate the calculation when the measurements differ significantly from the measurements of a standard pattern. I selected an example when a bust circumference of a client is 100 cm. Certainly, it is rather dangerous to use a pattern of a transparent corset with cut-off cups for such bust circumference. As the face will be an opaque corset it allows us to go beyond the traditions and use this pattern.